It perhaps goes without saying that Dior’s best selling floral symphony would top our Christmas gift guide. Always a sure-fire winner come Christmastime, J’Adore solidified its place is beauty lore with that cinematic advert featuring screen queens Marilyn Monroe, Marlene Dietrich and Grace Kelly. This luxurious purse spray is a really lovely way to wear the fragrance, featuring twist-action outer casing and 3 monogrammed 20ml fragrance refills to slot into the top. It’s the ideal size and weight to carry around in your make-up bag, allowing you to mist yourself with the iconic ylang-ylang, rose and jasmine scent wherever, whenever. On to another timeless fragrance, this one with a substantially longer heritage. 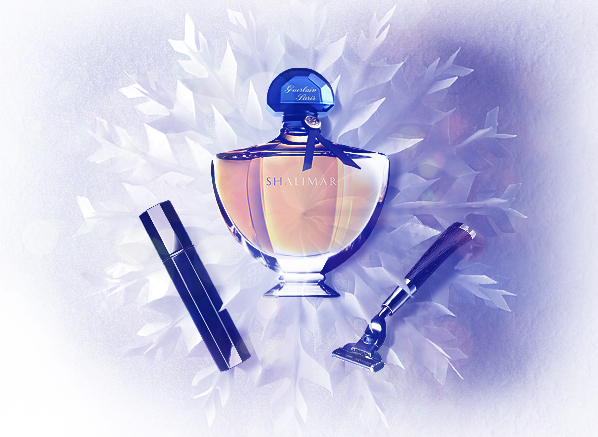 Shalimar was launched in 1925 by Jacques Guerlain, and is lauded by our fragrance expert Thomas as “the Queen of all Oriental perfumes… often considered as Guerlain’s magnum opus”. The exotic, smoky and ultimately romantic fragrance is an epic, marrying the richness of its Pakistani inspiration with some French flair. The result is a scent that has stood the test of time, and is as wonderfully indulgent today as it was in the Roaring Twenties. A must-try gift for serious fragrance fans. Another time-honoured fragrance here, and its one that is always a hit at Christmas. According to legend, couturier Jean Patou created the uplifting Joy fragrance for those women who could no longer afford his fashions following the stock market crash of 1929. Not only was the fragrance a more economical way to tap into sartorial circles, but the intensely floral, exotic composition was also quite the statement. This luxurious gift set is the perfect way to enjoy the fragrance, as it contains a 200ml Body Cream that isn’t available to buy separately. A must for any Joy fan. If you’re in the market for a new shaving set, you can’t get much better than this. The Acqua di Parma Collezione Barbiere line fuses quintessential Italian style with functionality, using some top quality materials that are built to last. Our favourite item is the Deluxe Stand, which features a pure badger hair shaving brush and a razor made of wenge wood and burnished brass. Stamped with the Acqua di Parma logo, it’s a seriously impressive bit of kit for the bathroom and best of all, it really is practical – the razor head can be replaced with a Gillette Mach 3 razor blade. There’s nothing like opening a truly luxurious fragrance gift set at Christmas, and this is up there with some of the best. Not only does it feature the largest size available in the Opium Eau de Parfum, but it also comes with the sumptuous perfumed Body Cream in a heavyweight 200ml glass jar. Just to make the gift that little bit sweeter both products arrive snuggled inside a chic patent vanity case, with structured sides, golden detailing and finished with the YSL stamp. It’s the sort of present that you’ll be telling your friends about for years to come. If skincare is more your thing, then you’ll love this luxurious do-it-all set. Featuring Clarins’ best-selling products for the face and the body in a variety full-sizes and travel editions, the wash bag contains everything you need for some serious pampering. Skincare can be a difficult gift purchase as you often don’t know the recipient’s skin type, but this this set takes out the guesswork. Stand out products include the universal skin prep Beauty Flash Balm (full size), the One-Step Gentle Exfoliating Cleanser (50ml), the Hand and Nail Treatment Cream (full size) and the Moisture-Rich Body Lotion (30ml), amongst other essentials. If you haven’t heard about Mason Pearson hairbrushes… where have you been?! In all seriousness, these award-winning, best-selling brushes are pretty amazing, a fact that’s even more impressive given the fact that they’ve been in production for over 130 years. There are three styles to choose from, ranging from pure boar bristle for fine hair to nylon for those with super thick tresses. However, our favourite is the one right in the middle of the road. The Mason Pearson Hairbrush Bristle/Nylon BN1 is large and is made from a combination of boar bristles and nylon, which gives beautiful gloss while doing a great job of detangling your locks. This investment brush is a perfect gift for someone who loves to take care of their hair – see our buying guide here. This highly regarded Serge Lutens classic is warm, rich and resinous – in other words, completely and utterly perfect for winter! In describing the scent, Lutens himself asserts that it “is not an Oriental in the traditional sense but rather an Arab and a Lutens”, and in that sense it’s probably unlike anything you’ve ever smelled before. The limited edition Tout Noir Travel Spray is an ideal way to wear the fragrance. The seriously good looking atomiser is matt black and very sleek, which allows you to tuck it into a jacket pocket or handbag with ease. A great present for the perfumista who has everything. This was a gift for my daughter who loves it. In fact she is pestering me to get one for myself. While she has a thick crop of auburn hair, mine is fine and thin. Information on the Escentual site is excellent with regard to choosing the right brush for different types of hair. I am saving up for a next purchase. This entry was posted on Friday, November 1st, 2013 at 9:00 am and is filed under Fragrance, Gifts, Haircare, Men. You can follow any responses to this entry through the RSS 2.0 feed. You can skip to the end and leave a response. Pinging is currently not allowed.